Coast redwood (Sequoia sempervirens) has the potential to be a high-value timber crop. Its timber is attractive and its high stability and natural durability make it ideal for outdoor uses. There is strong local and international market for naturally durable timber that does not require chemical preservation or paint for outdoor use. Most of this is supplied from redwood stands grown in the USA, which has a reputation for heartwood resistance to decay. Coast redwoods grow well in New Zealand, and we are well positioned to fill the demand for redwood products in the USA. However, there is a perception that New Zealand-grown redwood is less durable than USA-grown timber. The Scion research team believed that near-infrared (NIR) technology had the potential to be the basis of a rapid and cost-effective method to assess coast redwood heartwood’s resistance to fungal decay. NIR uses light energy from the near-infrared region of the electromagnetic spectrum to measure the heartwood chemicals present to detect differences. Rather than using expensive and time-consuming laboratory tests, NIR can rapidly identify heartwood samples that are more, and less, resistant to fungal decay. Coast redwood samples were taken from around the country. In all, 121 trees from eight sites were felled and over 10,000 individual heartwood samples were collected, representing trees across a range of genetics, sites and ages. Californian second-growth forest coast redwood (60-100 years) and radiata pine sapwood samples were used as controls. Each sample was tested with brown rots Coniophora puteana and Gloeophyllum trabeum, and white rot Trametes versicolor. The samples were infected with the fungal culture and incubated for 16 weeks. After incubation, samples were weighed to establish how much mass they had lost. NIR spectra were then collected from the samples. The results from the NIR tests show that New Zealand-grown coast redwood is as durable as redwoods from USA second-forests. 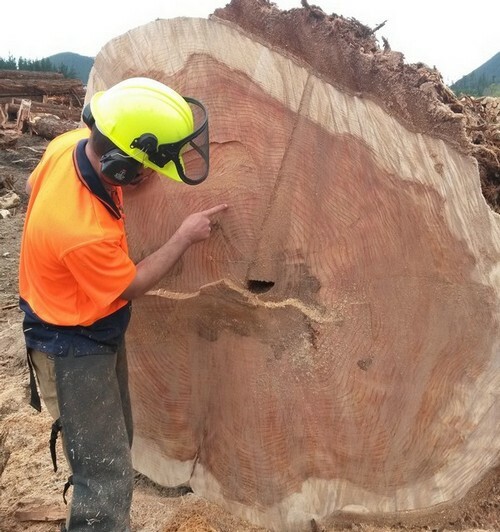 Heartwood from New Zealand-grown trees aged 46 to 90 years old had similar durability characteristics to heartwood from Californian-grown trees aged between 80 to 100 years old. The NIR results also showed that the genetics of coast redwoods have a strong influence on heartwood durability. Seedlings from the same genetic material, no matter where they are planted, will likely have similar heartwood durability characteristics at harvest. The New Zealand redwood sector now has a test method to quickly screen coast redwood heartwood for durability. The next steps are to understand what research is needed to refine the durability ratings obtained with NIR with more samples, and to provide New Zealand Standards with a statistical link between the durability measured using this method and the traditional environmental exposure durability tests.